TURIN, Italy –- Fiat S.p.A. will fall half a million units short of its 2.7 million sales target next year, while its U.S. subsidiary Chrysler Group LLC is forecast to hit its goal of selling 2.4 million units, the Italian automaker said. Although Fiat-Chrysler expects to grow to just 4.6 million units next year, Sergio Marchionne, CEO of both companies, confirmed his target of 5.9 million sales in 2014. To reach Marchionne's target, Fiat-Chrysler would have to grow combined sales by 1.3 million units in 2013 and 2014, which is equivalent to growth of 14 and 12 percent in both companies respectively. "Marchionne's 2014 volume target looks truly challenging, unless Fiat's core markets can show a substantial rebound in the coming years, which looks unlikely now," Massimo Vecchio, a financial analyst at Mediobanca in Milan said. "Despite the probable downturn in Western European 2012 new vehicle demand, especially Italy, I think the company is expecting to benefit from the market onslaught it plans to unleash over the next three years with 35 new or significantly redesigned models, the bulk of which should come in 2013," said Richard Hilgert, automotive analyst at Morningstar, based in Chicago in the U.S. When Marchionne unveiled Fiat's 5-year plan in April 2010, he forecast the Italian automaker would sell 2.3 million units this year and 2.7 million next year, but the latest revision to this forecast now predicts flat sales of about 2.2 million for both 2011 and 2012. According to a Fiat spokesman, the automaker's 2010 plan was based on higher volume assumptions for both the Italian and western Europe market. Fiat predicted passenger car sales in the European Union plus Iceland, Norway and Switzerland would reach 14.6 million units next year. This volume would have represented a rise of 900,000 units over the 13.7 million units expected this year. Reduced new-car sales resulting from austerity measures imposed to combat the sovereign debt crisis in the eurozone are leading forecasters to predict next year sales will decline by between 2 and 6.5 percent to 13.4-12.8 million units, which represents a drop equivalent to 300,000 to 900,000 fewer units than this year. Compared to Fiat's original prediction, a sales decline next year could increase the drop by 1.2-1.8 million units. In addition to market weakness, Fiat also has its own weakness, an aging product range, which has led to a loss of market share in Europe this year for the automaker. 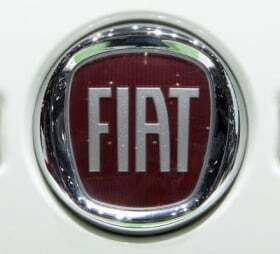 In the EU plus Iceland, Norway and Switzerland, Fiat's market share in the past 11 months – including sales of Chrysler and Jeep models – fell to 7.0 percent from 7.9 percent in year-on-year figures, according to data from the European auto industry association, the ACEA. In November, Fiat's share declined to 6.3 percent from 6.9 percent the year before, as volume decreased 11.7 percent to 67,640 units in an overall market which was down 3 percent to 1.07 million units. Italy, where Fiat controls 30 percent of sales, falls short in any forecast. Sales this year will decline over 10 percent to 1.75 million units – the lowest level in the past 15 years – and 250,000 units below Fiat's original forecast of 2 million sales. In 2012, foreign automakers are predicting a further decline to 1.68 million units, which could result in 520,000 fewer sales than Fiat's original forecast of 2.2 million.